This view shows one quarter of one of the two dozen art fairs. Granted, it's the largest but that's still a lot of art! 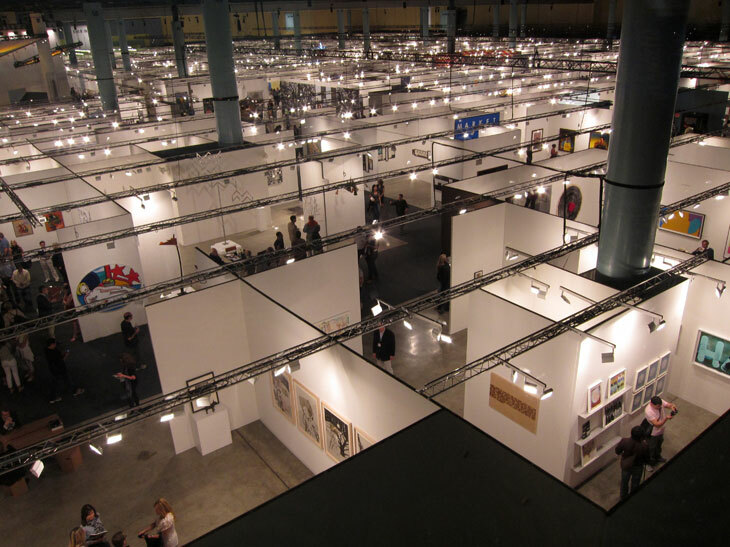 The circus of art fairs that happens every year in Miami can be daunting on many different levels. It’s visually overwhelming to visit a thousand or so galleries in a weekend. The schlepping is almost as taxing physically. Perhaps the hardest part for an artist, however, is the in-your-face assertion of social hierarchy and market-making. It can feel like a punch below the belt. Because there is no objective way to measure the worth of a work of art, the market is largely built through social jockeying that established hierarchies within each Art World constituency—galleries, artists, and collectors. Position is power and while there is much that is wonderful about such a vast assemblage of creative talent, this event is a market foremost and ugly emotions such as pride and envy are not necessarily discouraged. I went to Miami to see and be inspired by amazing art, to catch up with friends I see less frequently since moving to Virginia, and—let’s be honest here—to advance my own position within the hierarchy. How does one do that without feeling inferior or without behaving crassly? These are standard concerns within any marketplace, but with a pretty big dose of salt for an artist since I am my business. There can be no firewall between my soul and that which I produce and sell. A least that’s how I feel. So I wanted to do well but also to stay upbeat despite all this sausage being made around me and I wasn’t sure how I would do it. In truth though, it’s really just a decision toward the kind of person I want to be: generous, serene, joyful, and the active application of those virtues in my every action. Thinking that way made the whole experience a lot more fun, and probably more successful too. It’s the only way to live anyway and that’s how I approached it. And you know what? It was a good weekend.